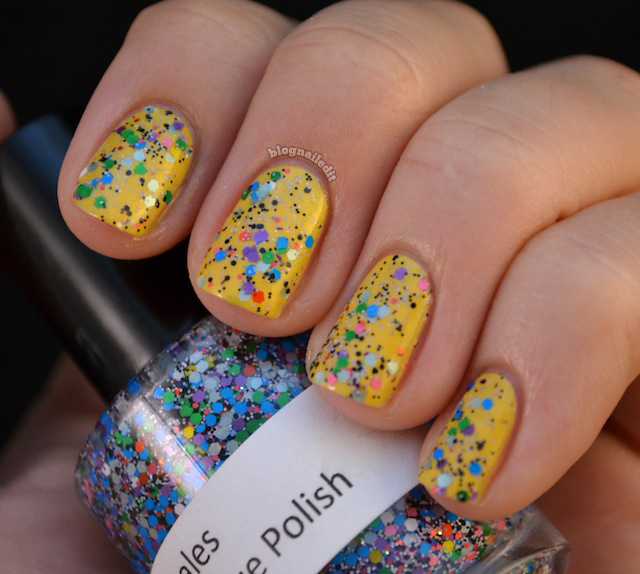 Some polishes actually lose their greatness when over-combined with nail art and colors. I have been daydreaming about what to do with two polishes since I got them not long ago, but ultimately, I think the best decision for them is to just leave them alone. KISS...Keep It Simple Stupid. 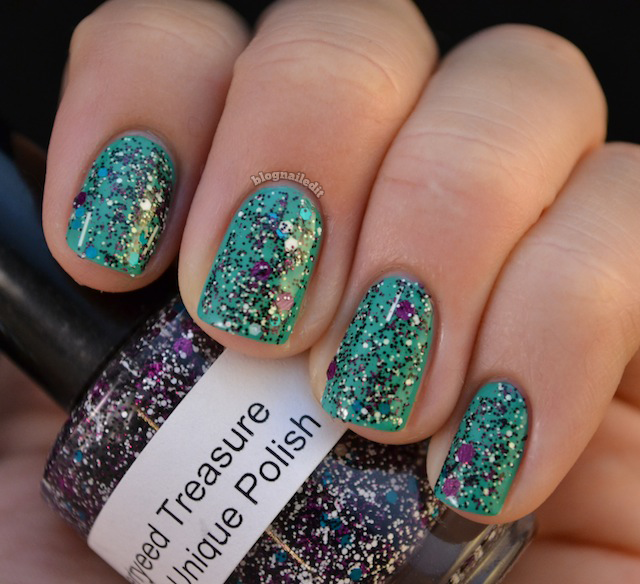 These two polishes are both chunky glitters from an online Etsy shop called Naild'it, an appropriate name for this reviewer. I'm silently kicking myself for not being more clever in the naming of this blog. I'm not kicking myself for buying these glitters though. In fact, quite the opposite. 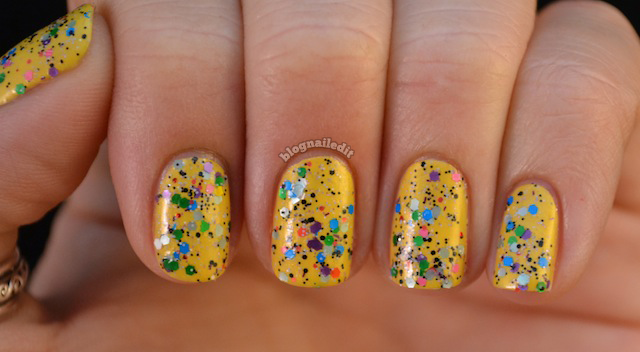 I'm kicking you in the direction of the shop, urging you to pick up a glitter or two from Naild'it. 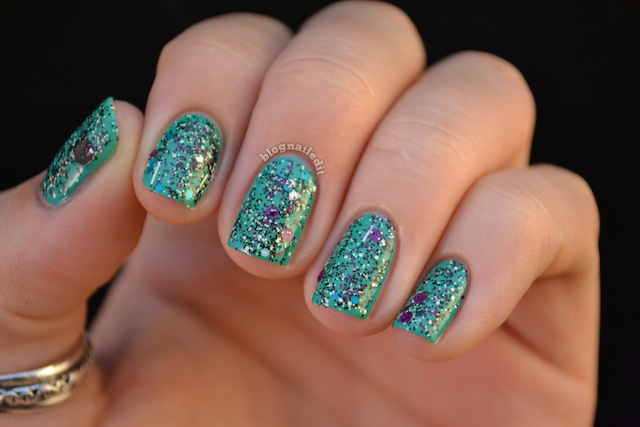 It's a fun matte mix of different shapes and colors of glitter. What got me were the bright colors, and particularly, the blue. It just doesn't shine. Not in the sense that it doesn't make me excited, but in the sense that it wouldn't pull in any rescue boats if you were trying to use it to signal for help lost out at sea. It's a true matte. Most of the pieces in the bottle are the same size, which is nice. No surprise bars to trip you up during application. It's a little on the thick side, so I had to be careful not to let it glop up and pick up the base color (Solar Power - China Glaze). I love it though. I'm wondering now how it would look under some jellies instead of layered over cremes (one layer shown here). Before Dragon Scales arrived, I got a message from the shop owner asking if I'd like a freebie to review. Who's going to say no to that? She decided to send along a very different glitter, Berryeed Treasure. This is obviously a much darker glitter, and the sizes in it vary more. It's generally made up of the itty bitty blacks, but sprinkled in are purple, white, teal and larger black bits. I say sprinkled because the ratio of itty bitties to larger pieces is perfect. I can't do polishes that are all huge glitter pieces. Give me itty bitties strewn with bigger pieces any day. You can see on my thumb in the first two pictures that some pieces are ginormous, but I didn't get that on any other fingers, so don't worry if you're not a fan of those. This one seemed a little easier to work with, and I mostly attribute that to the itty bitty to bigger ratio. 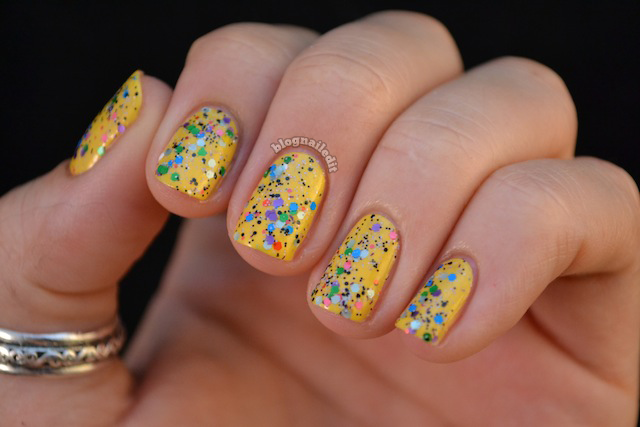 I layered one layer over Happy Go Lucky (China Glaze). I think you can understand why I'm not rushing to add nail art to these glitters. They do a lot of the work on their own, and would really just look cluttered with many more additions. I've got three more colors coming soon that I purchased today: Olympic Rings, Froggy Pond, and Vegas Sands. I definitely owe my Helmer a solid massage for all the weight its indie drawer is carrying now. Part of these products were sent to me by Naild'it. The reviews are based entirely on my experience with the products and were in no way influenced by anyone. Dragon Scales is beautiful over Solar Power, very pretty!! I like them both, but Dragon Scales are my favorite! Love your swatches. These look wonderful.